High dependency on the oil sector. The KRI’s economy is highly dependent on oil that has enabled rapid economic development. Though suspended in 2014, constitutionally-mandated oil revenues from Baghdad constituted about 85 percent of the KRG’s revenue. The sector, however, is only estimated to have a 1 percent share of the region’s employment. High oil dependency has enabled a rentier state. Excessive role of the public sector. The public sector dominates the KRI economy. 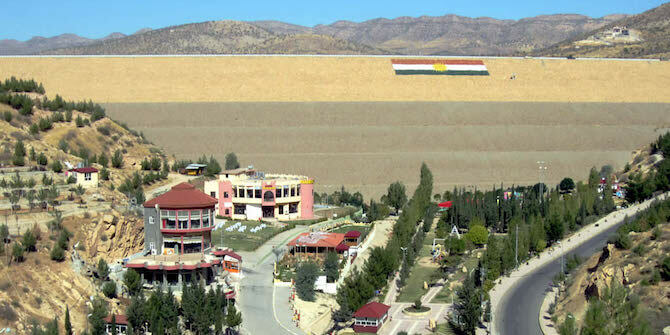 The KRG is the main employer with over 50% of total employment, 26% non-military. As in the rest of Iraq, payments for salaries, pensions, social assistance, and subsidies (electricity, fuel, water, and health and education services) consume over 50% of the budget. Taxes are only about 5% of total revenue. At this stage, public expenditure remains a primary driver of economic growth. Despite the strong entrepreneurial spirit, the greatly expanded KRI private sector still has a long way to go to meet its potential. Dependency on imports. Due to the relatively undiversified Iraqi economy, aside from oil exports, there is a huge gap between the demand for locally produced food and other products and the consumption of imports, a typical feature of a rentier economy. Virtually everything is readily available in the Region. Under the current policy regime, it is hard for local businesses to diversify and grow vis-à-vis imports. Weak financial system and dependency on a cash-based economy. A conflict with ISIS from mid-2014 that reached to within 20 km of Erbil. A rapid population increase of 28% as a result of the influx of 2 million displaced people from the rest of Iraq and Syria. The sharp decline in international oil prices, from $115 per barrel in June 2014 to about $45 in 2017. The suspension of revenue transfers from the national government, from $12 billion in 2013 to about $1 billion in 2014, to zero in 2015. Under a 2005 agreement that broke down in 2014, the KRI was to receive Iraqi state revenue based on estimated proportional population. Along with the failure of the national government to enact hydrocarbon and revenue sharing laws, around 2007 the Region began implementing a regional oil policy with a constitutionally sound oil and gas law that enabled leading oil companies to operate within a more market-oriented framework. Begun only after the 2003 overthrow of the Saddam regime, the KRI’s oil and gas industry is still in an early stage. Exploration continues all across the Region and production continues to markedly increase. Based on its hard experience with excessively centralized national governance, the Region has taken major steps toward ensuring personal security, energy security, and public revenue security. In accordance with World Bank guidelines, the Regional Council for Oil and Gas Affairs invited the “Big Four” international accounting firms to tender for a project to produce a report on the KRI’s oil and gas industry. A Master Service Agreement (MSA) was signed with Deloitte and Ernst & Young. Deloitte has been engaged to audit KRI oil and gas production and earned revenue. Deloitte’s first report was for the first six months of 2017. It is publicly available and additional reports going back to the beginning of the KRI’s oil and gas industry are expected. The KRG’s payroll issue is neither new nor unique. As is the case in rentier economies throughout the world, state-sector employment has long been one of the primary channels through which oil export revenues are distributed among the population. To address the excessive government staff issue, in order to continue receiving their salaries, whatever their names may be on official records, all staff have had to re-register with biometric data including iris scans that cannot be faked. A filtering and examination process has begun to eliminate double and triple dippers, so-called ghost workers, and other unauthorized and unqualified recipients. On the government payroll, only about 700,000 are actually government staff (58%). Others include pensioners (20%), bona fide social welfare beneficiaries, and families of those who disappeared in chemical weapon attacks, the Anfal campaign, and other struggles. Of the 700,000, 40% (281,000) are security staff – police and Peshmerga. 60% (415,000) are non-security staff of whom 51% (212,000) are health and education staff including more than 100,000 teachers in K-12 classes alone, not including those who teach in the KRI’s 15 public universities. By favouring the rapid development of the private sector, the KRG has greatly enabled the expansion of job opportunities. Recent punitive measures by the Baghdad government along with the loss of the constitutionally-mandated share of national revenue has severely, adversely affected job opportunities. The influx of displaced people including educated, skilled, and experienced refugees from Syria has also adversely affected employment in the Region. In 2009 the KRG engaged PricewaterhouseCoopers (PwC), another of the “Big Four”, to help develop good governance with a focus on integrity. Good material was produced, in Kurdish, Arabic, and English, including a Code of Conduct for government staff that addressed conflicts of interest. But, like the Iraqi Constitution, words on paper are just that unless there is an effectively implemented roadmap to put such ideas into practice. Of 180 countries on Transparency International’s Corruption Perceptions Index (CPI) 2017, Iraq ranks 169, the 11th most corrupt country in the world. TI’s CPI includes only countries, not subnational entities. However, in 2014 a report by The Economist Intelligence Unit (EIU) ranked the Kurdistan Region well above Iraq (and Iran). Some view the KRG’s economic reform program as a case of ill-timed fiscal austerity when in fact the KRG really has no alternative. In the absence of any other way to make ends meet, cutting expenses and raising revenues are its only options. Reducing payroll fraud, moving toward eliminating subsidies, and improving tax collection are all positive steps, though it is naturally too early to say whether any of the changes now underway will lead to permanent improvements in public sector governance. There is reason to be cautiously optimistic about the KRG’s efforts to make ends meet in the short term. Phasing out subsidies has already made a significant contribution to balancing the budget and the effectiveness of biometric registration and a more aggressive taxpayer office may yet have the potential to brighten the fiscal picture next year. However, the extent to which these initiatives can bring about lasting reform is less clear. The old habits of the rentier economy will be hard to break. If these strengths and opportunities are used effectively in a supportive policy environment, the KRI economy has a good chance to overcome current difficulties and have a more diversified economy and sustainable high growth in the medium to longer term.